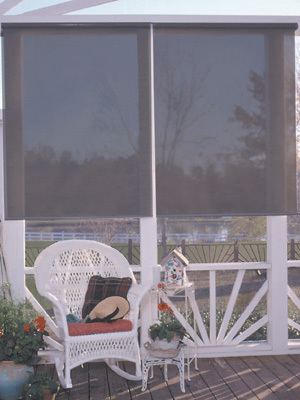 Exterior Rollup Solar Screens are made with durable Phifer Suntex Solar Screen Fabric. Use them on your patio or porch to make your outside lounging area more comfortable. Use them on your windows where you may not want heat gain protection all the time. Standard construction is with a 16lb clutch, internal hem bar and plastic bead chan. Upgrade to a stainless steel chain or add bottom grommets to attach hold downs. Great company to do business with. Great quality screens made exactly as I ordered and very well packaged for shipping. Quickly made, shipped & delivered. Also great communication.